Fully race ready just needs a driver. 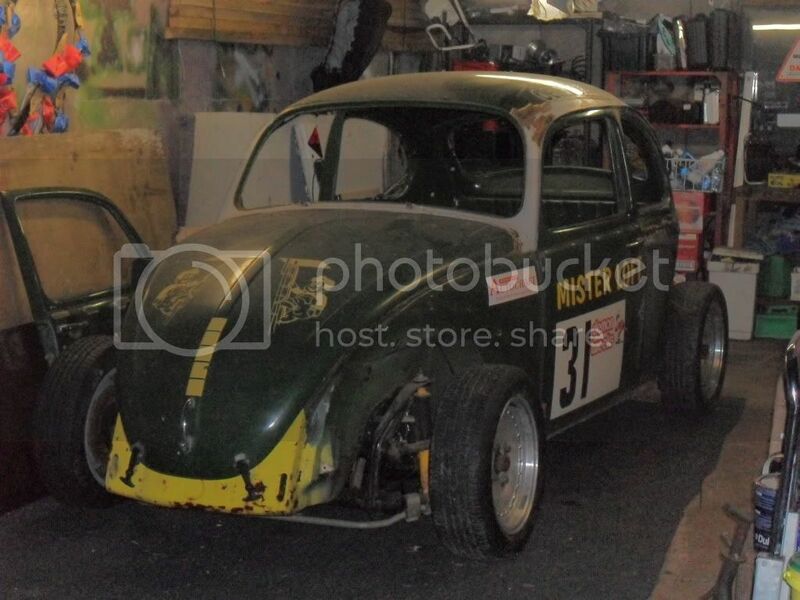 Fresh built 1776 road legal & tax exempt £3650. The build up to the event was as furious as ever. 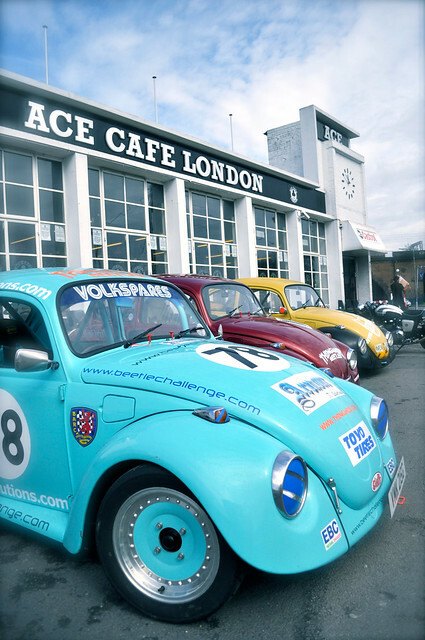 Not only was this set to be the first Aircooled Only Bug race for nearly two decades, there were also three cars making their debut appearance on the grid, the Blue No.5 car (On loan from Craig ‘Gandpa’ Winfield) driven by Stephen ‘Buggy’ Page, the No.59 College of North West London (CNWL) / VW Heritage car, being piloted by Trigger from Thingamies, and the No.58 VolksWorld Car being raced by ‘Dodgy’ Dave Dodge, the VolksWorld Competition winner! The crew at the college had been burning the midnight oil installing new equipment supplied by VW Heritage, breather systems, external oil cooler, new switchgear, new extinguisher, NACA ducts, and lots of other components into both the VolksWorld and College cars to meet the strict MSA specifications. 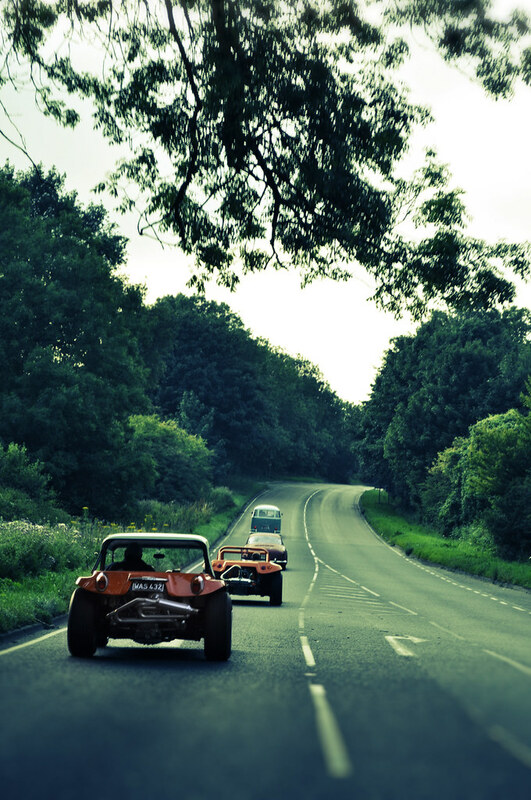 With the hours evaporating fast both cars were raced over together to Trigger at Thingamies HQ near Heathrow (metaphorically speaking of course.. Ahem.. strictly in a non-competitive manor!). 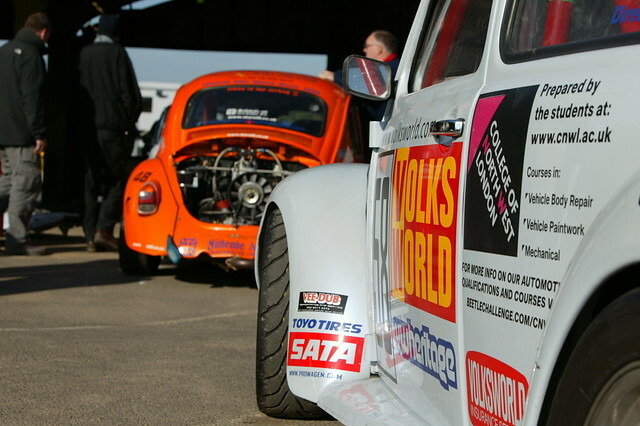 Trigger’s crew immersed themselves in the some additional race prep and final safety checks of both cars. 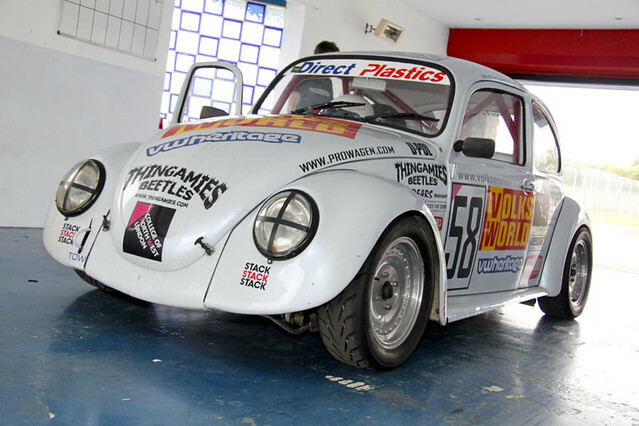 This was the first time Trigger had even sat in the CNWL/VW Heritage car, and he was going to be racing it in 48hrs! With less than 24hrs till driver sign-on disaster struck, a tow-vehicle blew a head gasket! 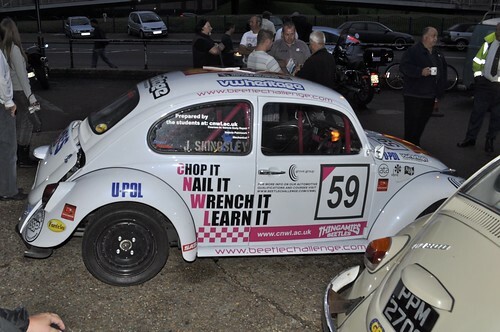 Cookie, one of the other racers, dropped everything and took a spare T4 Trig had in his yard to the College workshops, where Mechanical Engineering tutor John Skinsley swapped out a driveshaft and then procured a fresh MoT. 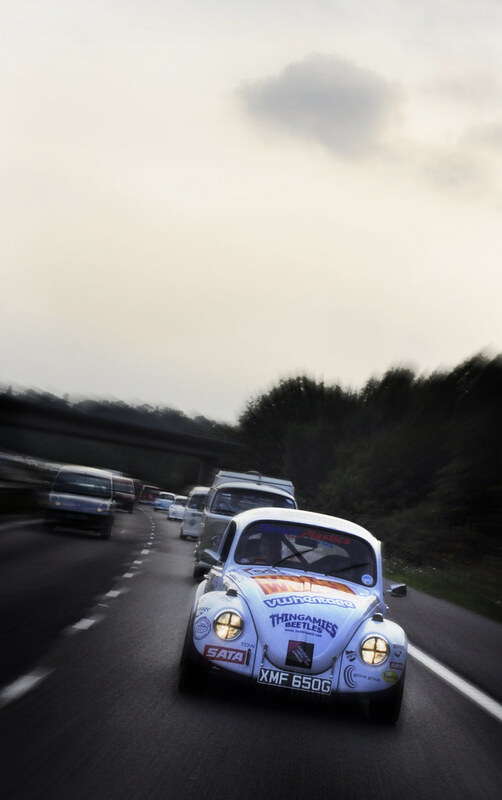 Race day arrived, and the bugs set off on convoy to Lydden Hill Circuit in Kent. 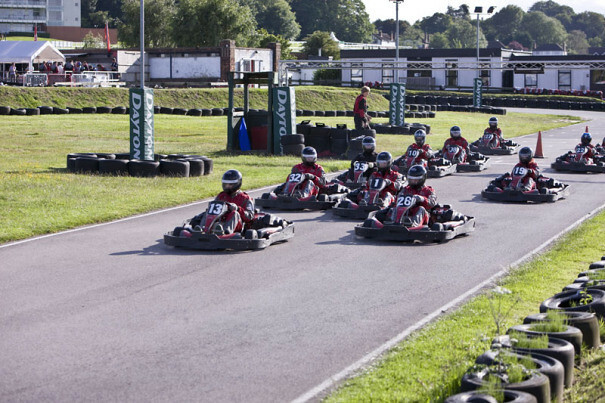 It’s a club racers favourite track, the circuit is set in a valley so gives unrivaled spectator viewing too! The temperatures were chilly but the sky was blue, so we were on for a dry race! 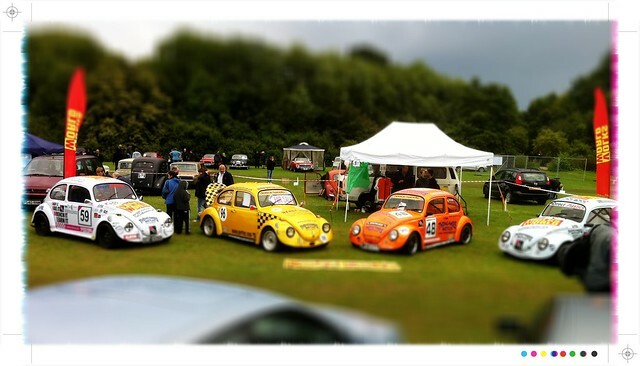 There was a nice turn out of VW’s along with some 356 Porsches and a spyder replica in the grounds. 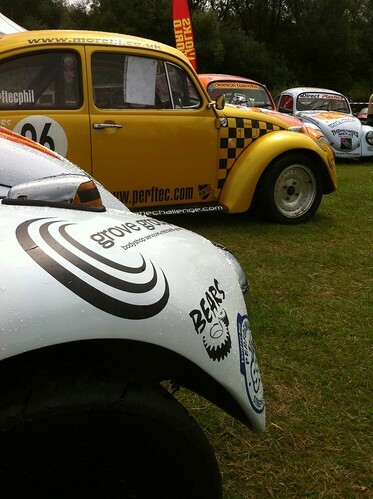 All the bugs passed scrutaneering (A nervous moment for all drivers! ), and we all geared up for Qually. 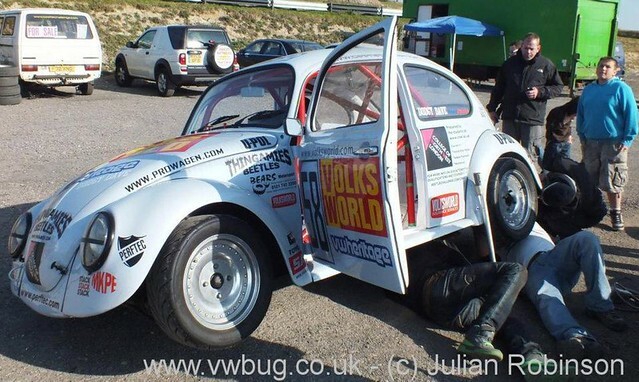 Then the second disaster of the day.. just as the clerk of the course announced over the tannoy that the Beetles need to make their way to the fire-up lane, the VolksWorld car blew an oil line in the paddocks, dumping VR1 Racing oil everywhere! 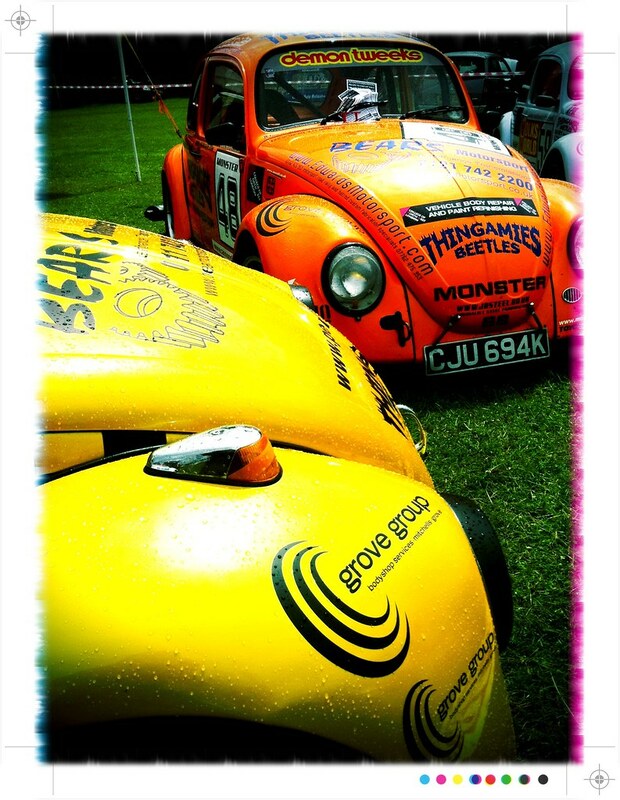 Some rapid spannering from Florence Butcher and Mavis from Thingamies saw Dodgy Dave and the race car make it to qually with just seconds to go! Nothing like a bit of drama to enhance your debut qualifying session! 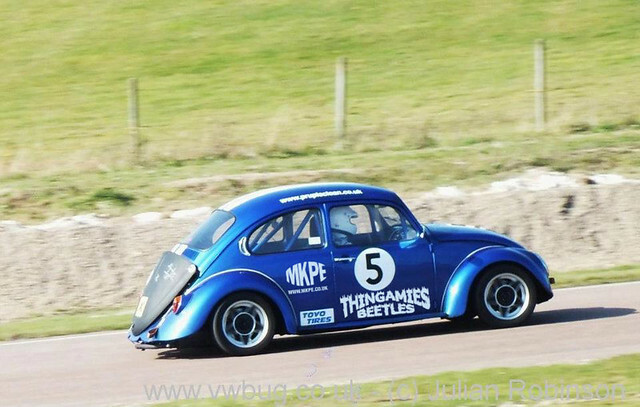 The blue No.5 car, driven by Stephen ‘Buggy’ Page was building up his confidence and pace consistently, the car he borrowed from Craig ‘Grandpa’ Winfield, only to retire due to engine issues.. to be fair the engine was a complete unknown quantity, and will now get a refresh and we’ll see him out again next season too! 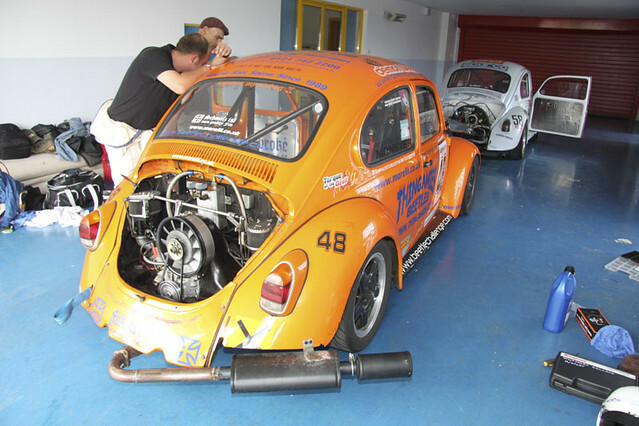 Finally the last retirement was ‘Grandpa’ in his No.78 car, which was really gutting, as he had personally put masses of time and effort getting the race organized, and he seized his new stroker motor after putting in just a few laps with great times on cold tyres. 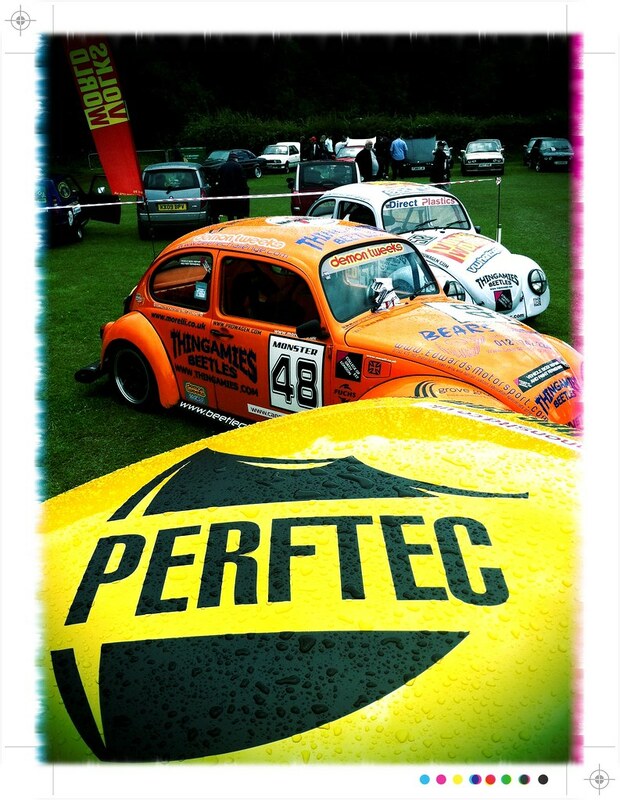 Perftec Phil in the yellow No.96 car ended up at the front of the grid for the race, with Simon ‘Monster’ Sergides, taking the second spot in his asbo-orange No.48 car. 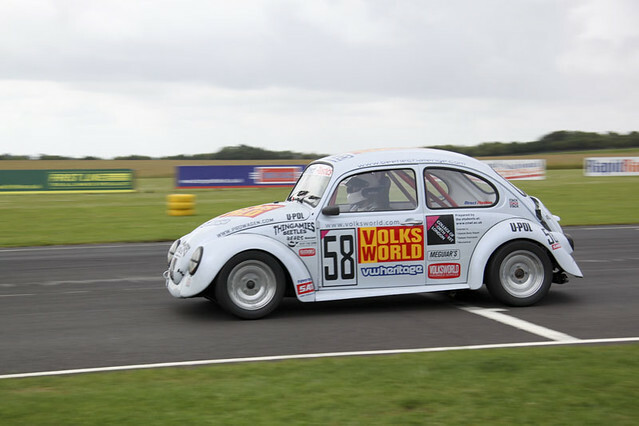 Completing the grid was Trigger in the No.59 CNWL/VW Heritage car and Dodgy Dave, the competition winner, in the No.59 VolksWorld car. 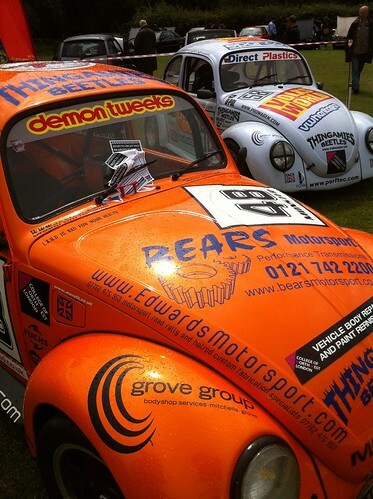 Would have been great to have all 7 cars on the starting grid.. but that’s racing! 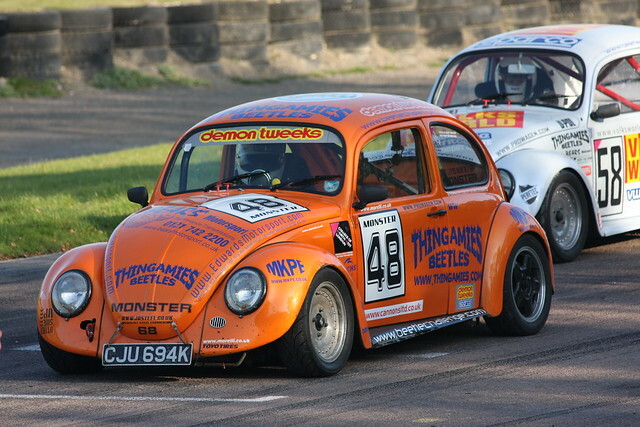 The first few laps saw some hilarious fisty cuffs between the yellow car of Perftec Phil, the orange bug Monster and Trigger in the No.59 CNWL / VW Heritage Car, with Monster and Trigger swapping positions in a fight that was allowing Perftec Phil to pull a lead. It was all tyre squealing action, apparently the spectators had their hearts in their mouths just watching the antics play out.. imaging what it was like for the drivers! It was heating up to be fierce battle for the podium positions.. and the usually reliable orange No48 car Monster had to pull in due to nothing more than a thrown fan belt.. but ended his race prematurely. 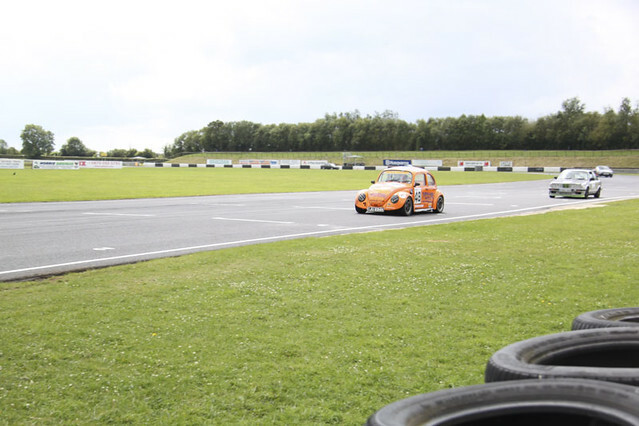 This released Trigger to hunt down Perftec Phil, and each lap he drew closer until they were bumper to bumper! 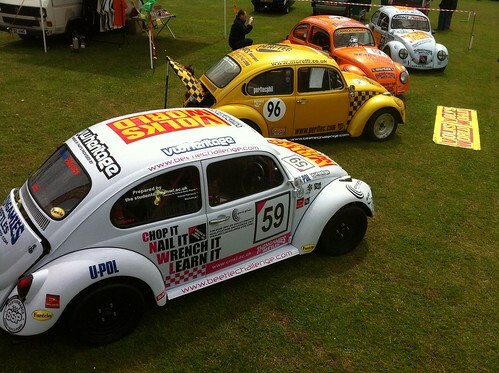 Meanwhile Dodgy Dave in the No.58 VolksWorld car was driving a consistent race… would Trigger and Phil trip each other up and give him the lead, but either way he was on for a podium position if he could just keep it all together and stay on the track without incident. The pressure from Trigger intensified, but Perftec Phil drove an epic defensive line, and made his car as wide as possible, lap after lap they were wheel to wheel. With just a few laps to go Trigger made a brave move and took the lead for the first time, with Phil now piling on the pressure from behind in a role reversal! 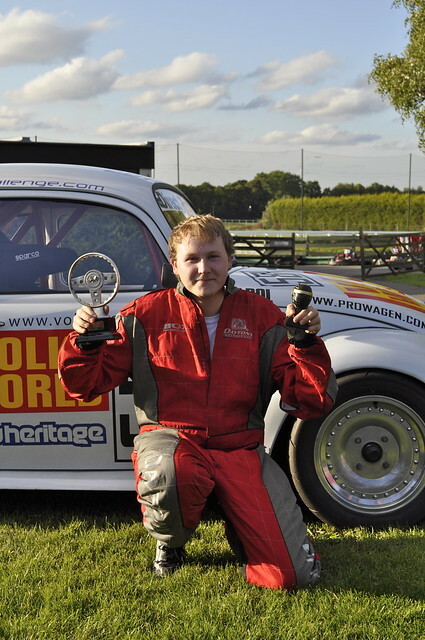 Eventually they passed the chequered flag with Trigger just in front, taking the win in the College/VW Heritage car, Perftec Phil in second place after a fantastic battle, and Dodgy Dave taking the third place on the podium in his debut race, debuting the VolksWorld car! 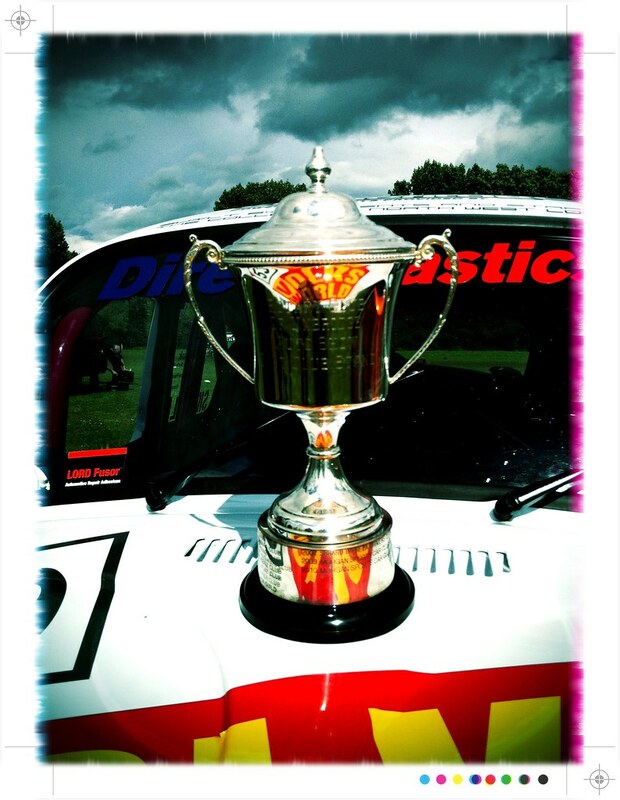 Reliability proved to be the biggest challenge of the weekend. 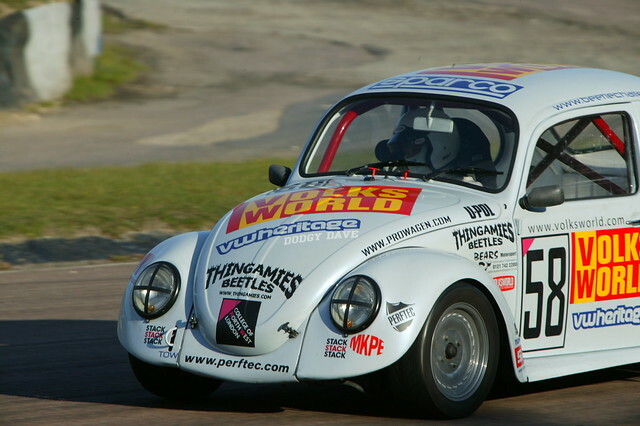 VW Heritage supplied parts in two of the podium winning cars, and featured their ‘all-new’ 1641cc engine which has been relentlessly tested in the VolksWorld car prior to the race, which is a testament to their quality.. abuse doesn’t get much tougher than circuit racing! 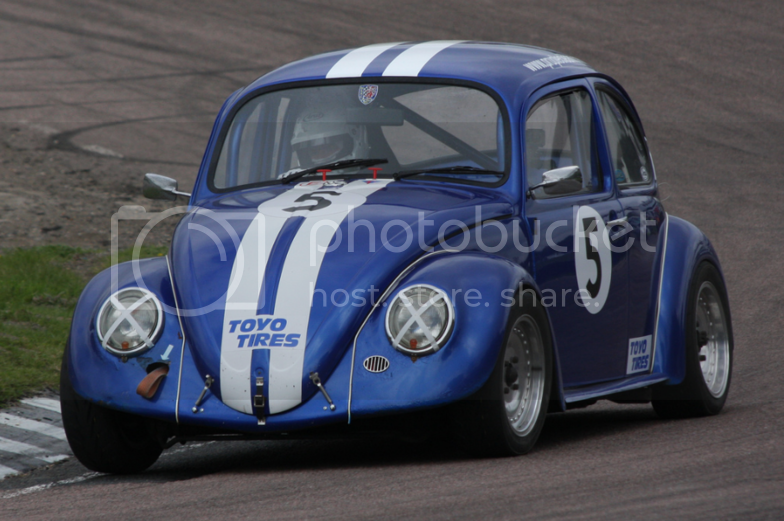 Although these times have some mitigating factors..
Grandpa put in his time on only 3 laps with cold tyres before having mechanical issues.. so he was looking to be on fire.. would have loved to have seen what he would have achieved on hot tires and a motor firing on all four. Buggy Steve was putting in a remarkable show, on his debut race, but he too had mechanical issues. Perftec Phil knew he could shave at least a second off his time, in his reliable and trusty steed.. and proved it in the race! Monster had a noise restrictor in the header to get through the sound test, which strangled the life out of the motor! 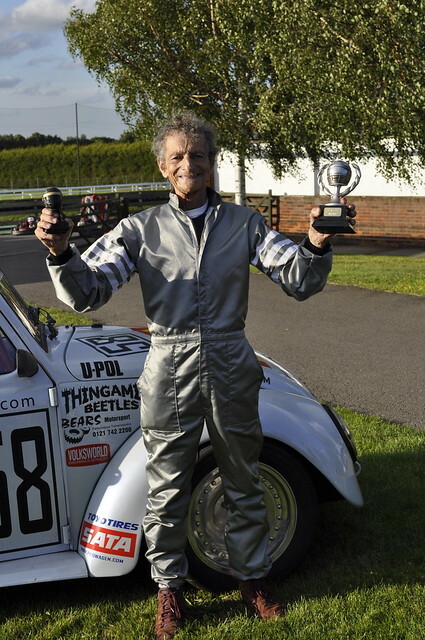 Perftec Phil - took the fastest lap in his 1641cc motor! 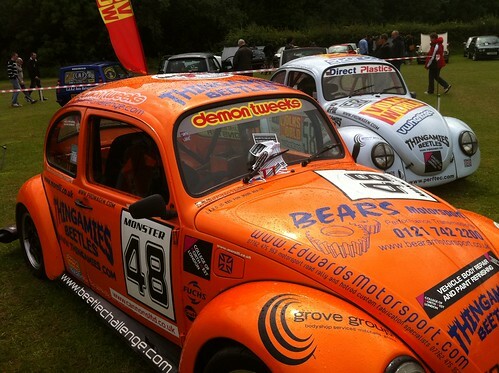 Last chance for entries tomorrow before the late fee is applied, save £25 and get them in quick !!!!! 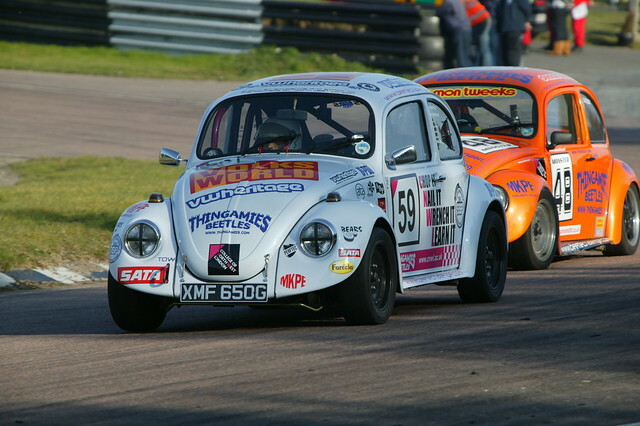 The race at Lydden will see the welcome return of the ex Peter Keys & Matt French Cup car back on track for the 1st time in over a decade in the hands of a new driver in his debut race. 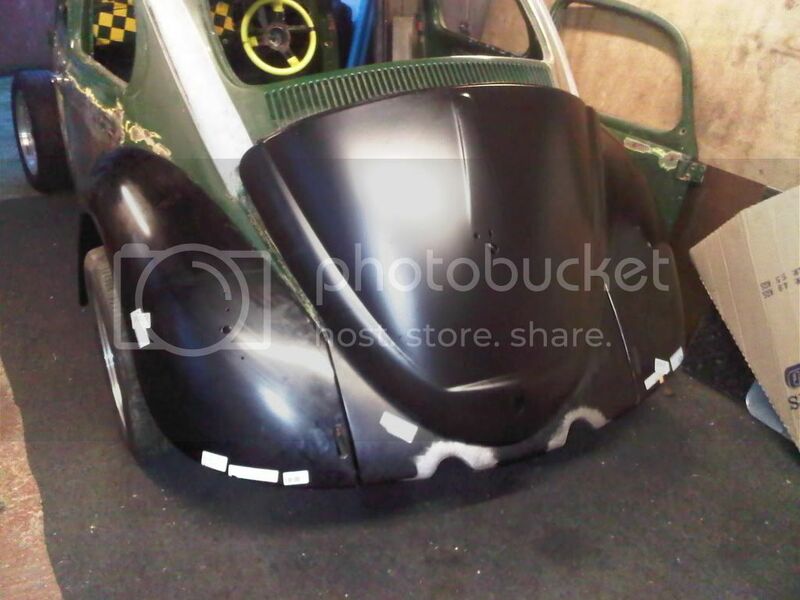 The ex Joe Flay Cup Car is up for sale includes the original Beetle Cup kit and comes with many new parts & panels. 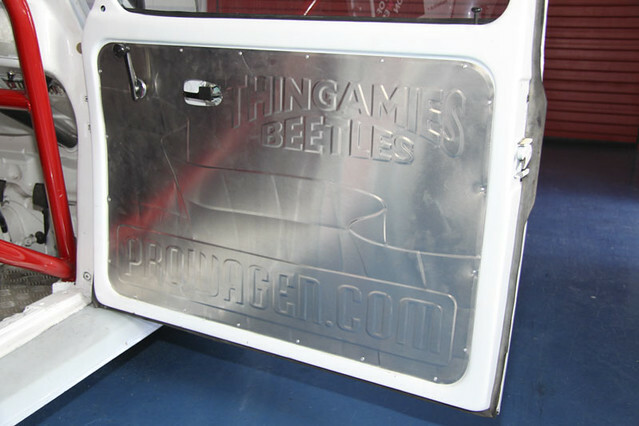 Easy project for 2012. £2000 contact Tom Huxtable 07866581030. The morning after the night before was a little surreal today, waking up convinced it was a Sunday, but the alarm clock clearly indicated it was just Thursday - Egh??? 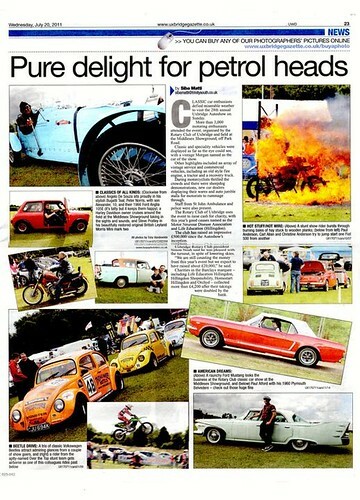 Were we not at a large scale VW show less than 12hours previously? Well, yes and no! 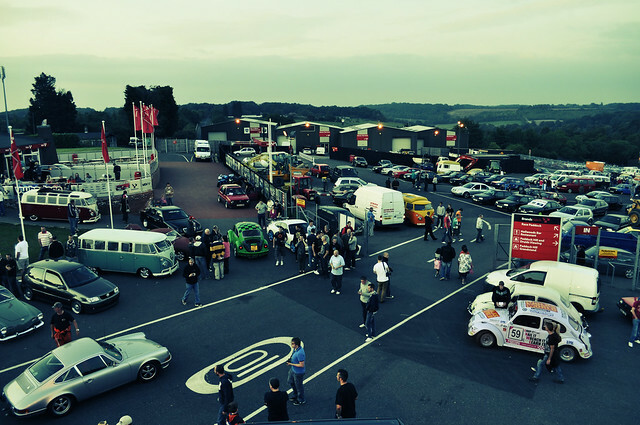 Yesterday was a ‘workday’ Wednesday, and after a full days graft we hit the road on towards our friends at VW Heritage, who just happened to be celebrating their 25th birthday by organising a cruise from their HQ to the hallowed grounds of Brands Hatch for an evening ‘meet’. 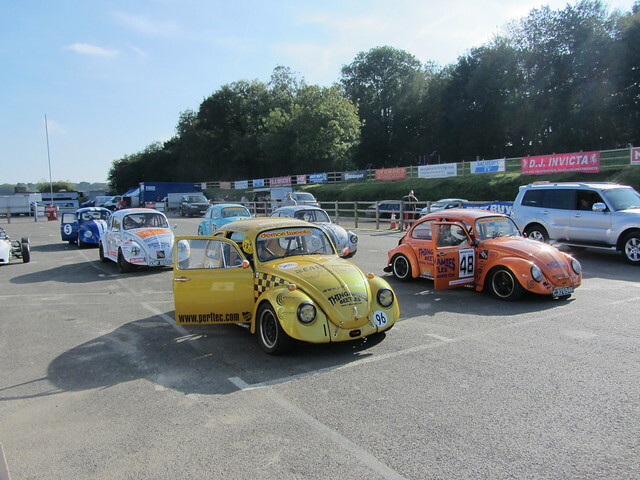 A brief stop at the Clacket Lane Services saw the convoy grow, to what must have been triple numbers of VW’s, both watercooled and aircooled, which then snaked towards the Hatch. There were long tailbacks at every junction leading in to the venue, not because of the rush hour (that finished well over an hour previously) not because of roadworks, not because of broken down retro-chic, but entirely due to the sheer volume of VW’s that had turned out for the evenings festivities. We had to double-take and pinch ourselves as this looked more like the procession into a weekender festival, rather than a Wednesday evening meet! Line after line of vintage, retro, race and modern machinery filled every available space, with multiple paddock areas and spaces continually being opened to meet the demand - the stewards were blown away, as there were more people in attendance than at the Formula 2 Racing the previous weekend! 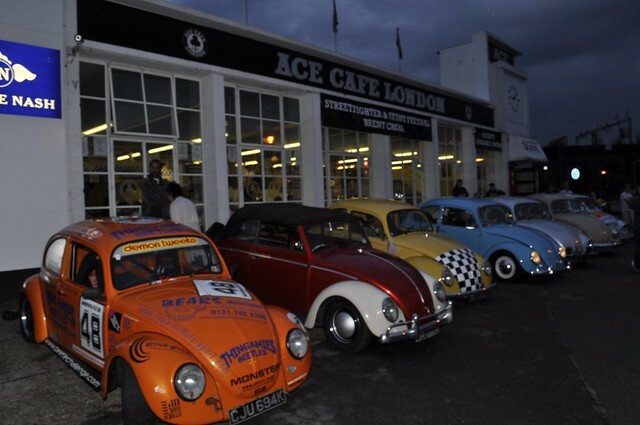 The birthday celebrations started with a ‘party bag’ from our hosts, VW Heritage, which also included a bespoke brewed birthday beer - a nice touch to get the party swinging - and a gourmet BBQ, which went down a treat. Altogether it was a brilliant night out… a night out that had all the atmosphere, energy and fun of a major weekend show… so I wonder, was I the only one that woke up on Thursday morning confused! 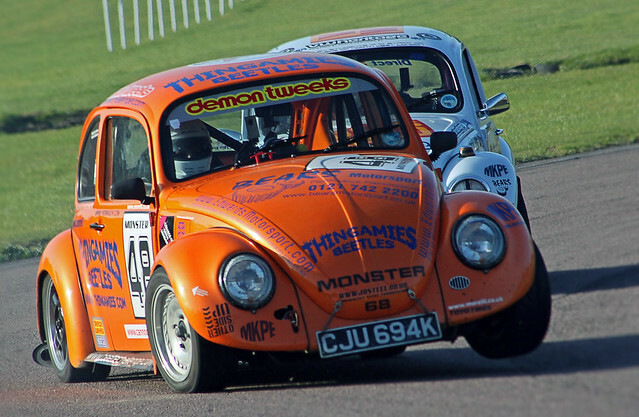 Both Dave Charlton and Cookie will be looking to extend their points this weekend, and work their way up the standings in the Tin Top championship also this weekend… The grids look jam packed so should make for some interesting racing. 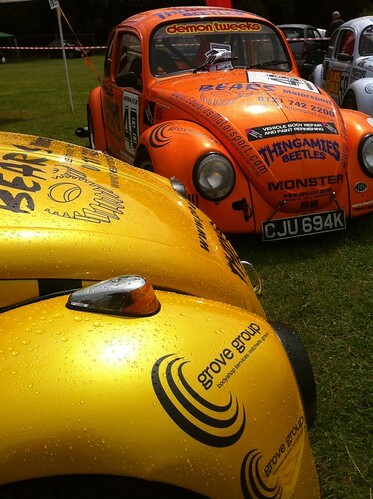 We will have a bunch of the Beetle Challenge cars at the Uxbridge AutoShow this weekend (www.uxbridge-autoshow.com) It has proven to be a big show now, with a mixture of all sorts of clubs, marques and exhibitions - from Vintage Cars / Bikes, an abundance of classic cars, 80’s Retro cars, Performance & Motorsport Machinery, Commercial vehicles, Sports and Custom Bikes, Yanks, Low-riders, Pimped out Hummers, Modern Machinery from many car / bike manufacturers that show their current range.. mixed in with a large swap meet, trade stands, funfair rides, stunt shows etc.. a real eclectic mix of petrol powered machines from the past century! 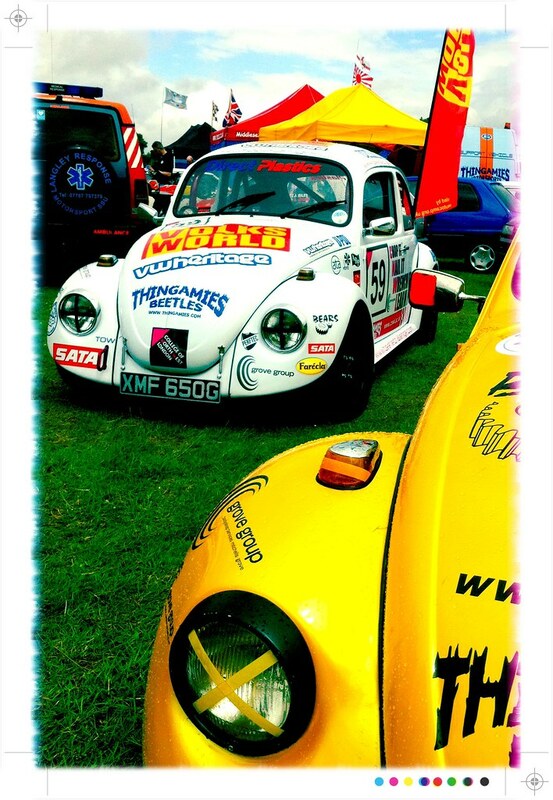 It’s definitely a great day out, and there is typically a great display of bug’s and buses throughout the show, and all proceeds go to various good causes, as this not-for-profit charity event grows year on year. For those of you that may require the postcode of the site, its UB8 1NS. Blue skies and baking temperatures made for ideal karting conditions at the Sandown Park Daytona outdoor track.One by one the Volksworld Show Prize Draw winners started to congregate at the entrance, teased at the sight of the Volksworld Race Car shimmering in the sun, baiting them to race hard and fast, as soon they would all be battling to secure the chance to race that very car in a round of the Beetle Challenge later in the year. Given what was ultimately up for grabs the atmosphere was fun and friendly (well what would you expect from like minded dubbers!) the only tension surfacing was on the zipper of Staff writer Laurence ‘Florence’ Butchers race suit (Too many pies recently?) 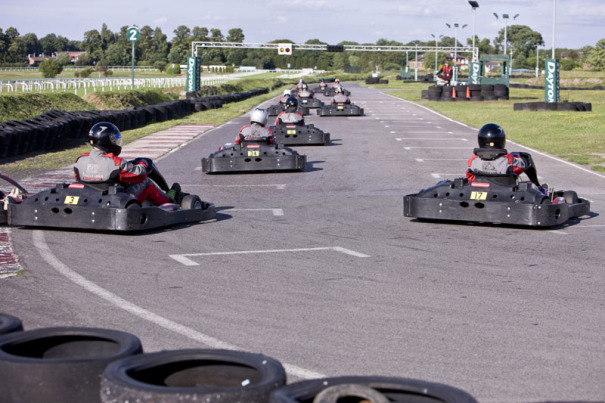 The karting action was fast and furious, with a lightning speed turn around between heats, Daytona run a slick operation and everyone had a blast! Connagh Flynn lay down the gauntlet in some style in the very first heat, with a lap average speed of 00:53:415 - an impressive 2 secs a lap faster than his nearest rival. Heat 2 saw Dave Benns throw the gauntlet straight back, being the first karter to break in to the magic 51sec laptime, backed up by a 00:53.113 average laptime, with nearly 3secs a lap quicker than 2nd place driver Sam Montague! 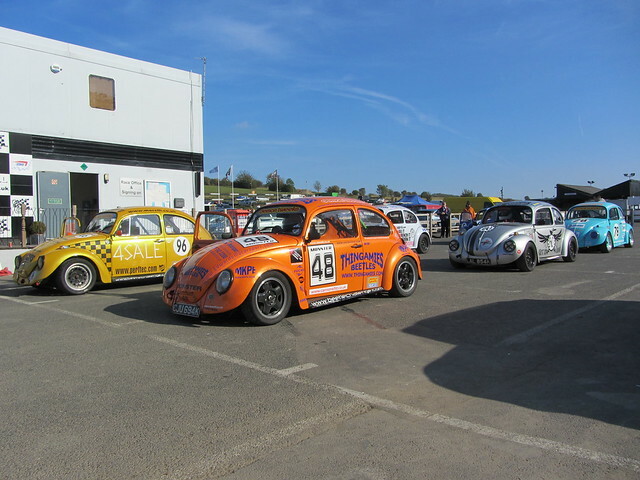 Connagh had an answer in Heat 3 putting in a 51sec lap and his average drop to the 52’s in a race that he led from pole position to the flag - being chased down by Adam Hunter who leapfrogged to 2nd place and a great drive from Andy Cross who progressed from fifth to third place. Heat 4 saw Dave Benns lead from the front, with Alex Frost and Rob Burns having a close race to second and third respectively. Andy Cross took the number one position at the checkered flag of Heat 5, with Connagh Flynn fighting his way through the pack from sixth place on lap one, right up to the second spot. The last heat saw Dave Dodge push through and take two crucial places, passing Rob Burns and Nathan Cuff on the last lap to secure the Heat 6 win. 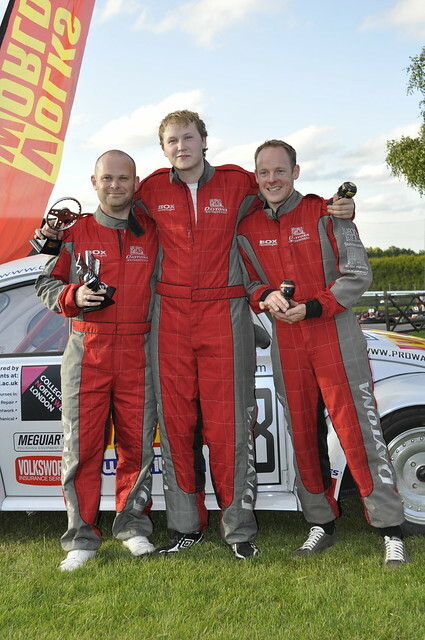 The second Semi Final saw Connagh Flynn pull off an 52sec average speed romping home to the top spot, with Nathan Cuff taking second place and an impressive drive from Andy Cross who made up several places to secure the number three spot. The grid was filled with Dave Benns, Rob Burns, Sean Brereton, Andy Cross, Nathan Cuff, Dave Dodge, Connagh Flynn, Alex Frost, Sam Montague and John Smart… The lights went out and the flying Flynn stormed off the start - infact he romped home to a dominating victory putting in lap after lap in the 51’s consistently, Connagh was fast! However behind him there was some serious dogfighting, Dave Dodge passed the timing marker on the first lap in fifth position, but focus and consistent laptimes saw plenty of overtaking and him in a podium position… laps four and five saw an epic battle between Dave and Rob Burns for the position two on the podium… Lap six saw Dave Dodge make the move and claim the second spot, but Rob was not rolling over, oh no he pushed Dave hard, with just two-tenths of a second separating them on the final few laps… Dave made himself wide with lots of defensive lines and ultimately passed the checkered flag in second spot with Rob taking third, but only just as Dave Benns so nearly took Rob on the last corner of the last lap! 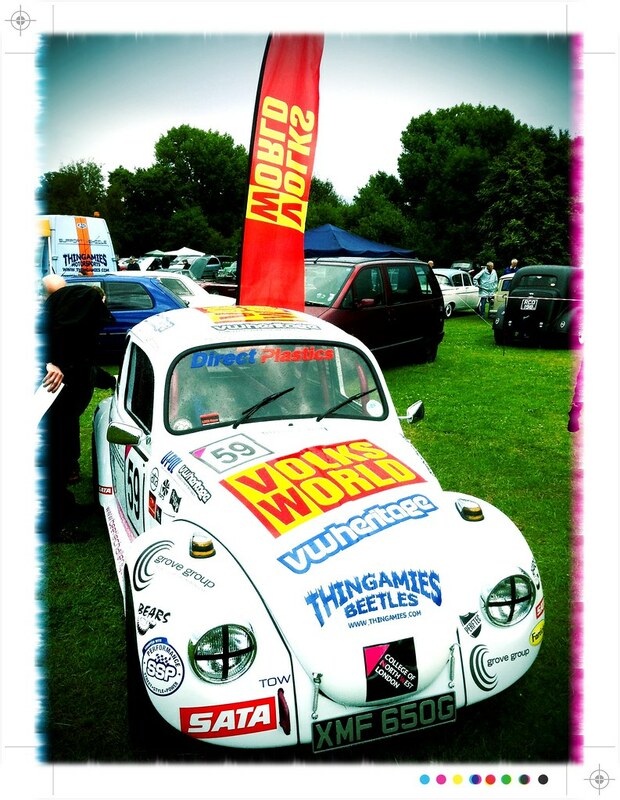 So congratulations to 1st Connagh Flynn, 2nd Dave Dodge and 3rd Rob Burns for earning their place in the next round of the elimination process, as they are one step closer to securing a drive in the Volksworld Race Car in a round of the Beetle Challenge! 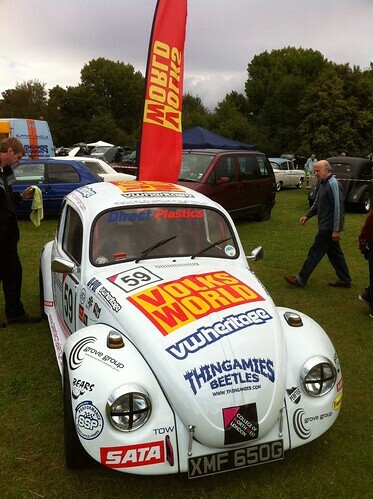 The Thingamies Award for Fastest Competitor Lap on the day went to Connagh Flynn who managed a 00:51:486 time. 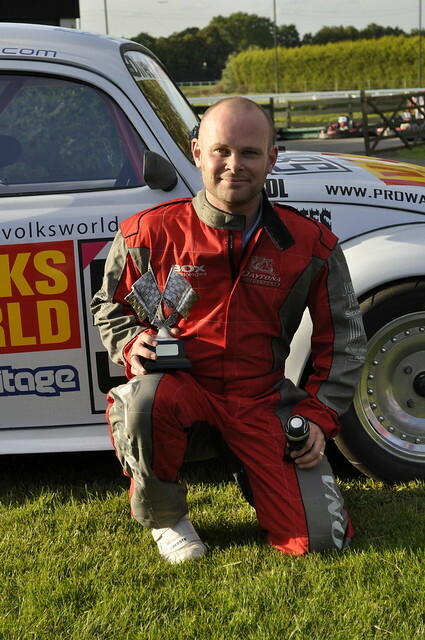 The Bears Motorsports Award for most impressive drive went to Dave Dodge. The Daytona Race Control team singled him out for his brilliant drive in the final from the back of the starting grid to the 2nd spot on the podium. Ivan couldn’t make the event, so as a token gesture Adrian Vaughn wore a T-Shirt with Ivan’s face molded round his belly! it all seamed quite apt as Ivan’s face rippled with the speed and g-forces! 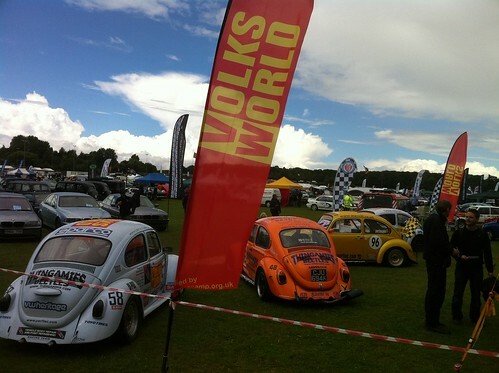 Tony ‘Hans Klapp’ (Volksworld) dominated every heat and race! 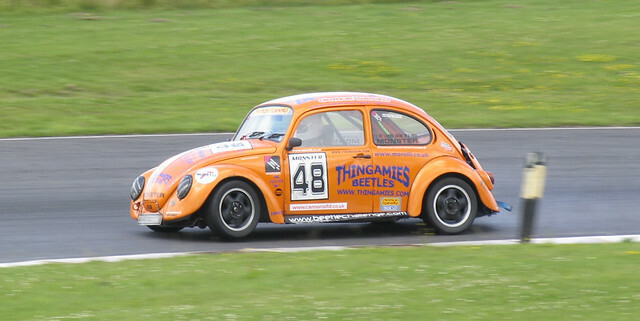 with many laps in the 51’s, Lawrence ‘Florence’ Butcher (Volksworld & Beetle Challenge Racer) had some great battles throughout the heats and took the second spot on the podium in the final, leaving Sam Elmore (Thingamies) to romp to third place in the final after some equally impressive heats, although his proudest moment was nudging Simon Sergides (Thingamies & Beetle Challenge Racer) off the track in the final! 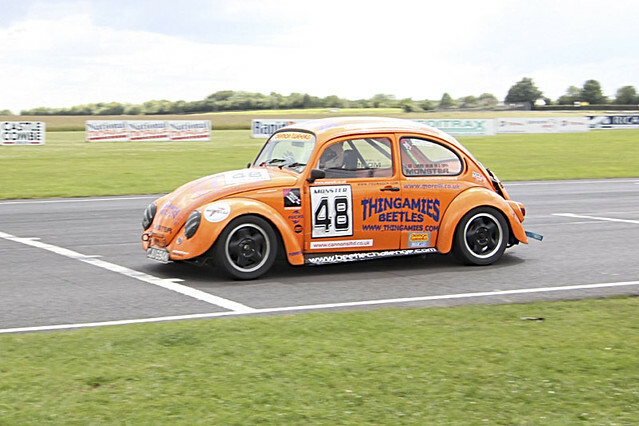 The biggest incident of the day must go to Phil ‘Perftec’ Thompson (Beetle Challenge Racer), who was forced into a spin coming into the back straight, Craig ‘Grandpa’ Winfield (Beetle Challenge Racer) managed to squeeze past on the tarmac to make up a few positions in a blink of an eye, but Adrian and Simon came round the corner at full chat only to be confronted by Phil’s stationary kart just meters away… you could see the look of ‘Oh my g** this is it’ in Phil’s eye’s as 19stone of Simon at terminal velocity was thundering towards him.. Phew he missed! but Simon ended up like a beached whale in the tyre wall, and in true gentlemanly style Phil waved goodbye and drove off into the sunset! 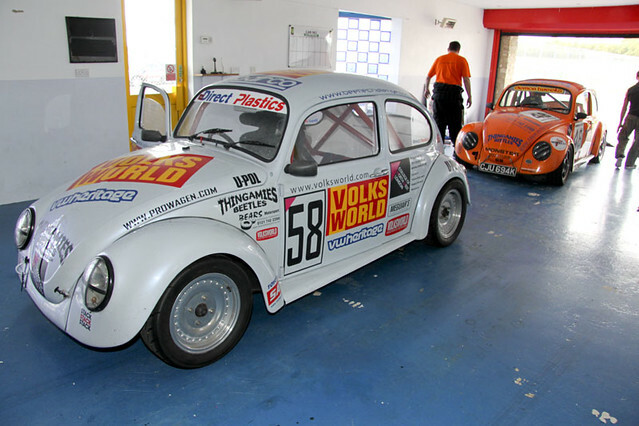 Have you ever wanted to drive your V-Dub on a race track ? Well now is your chance! 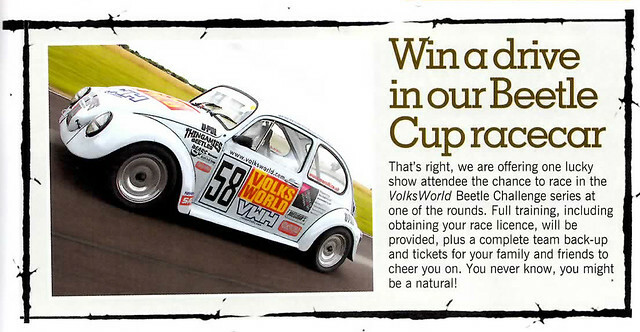 VolksWorld Magazine is holding a track day at the Castle Combe circuit on 7th July 2011. 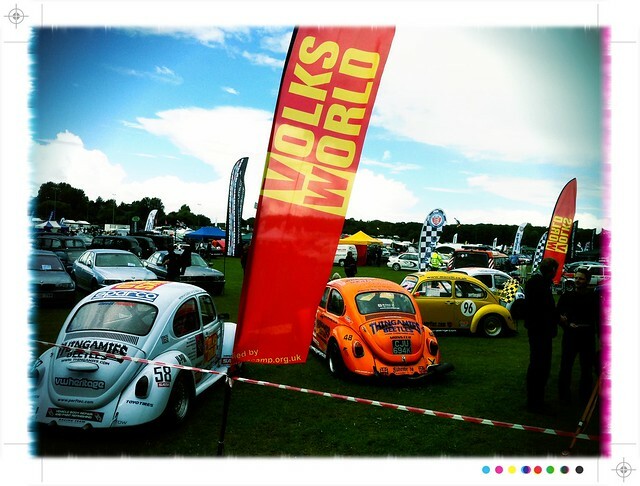 Ivan and the boys will be in attendance giving our own race car a dust down and testing some parts for the magazine, so come and look at what they are up to and see just what goes into producing an article for VolksWorld Magazine. 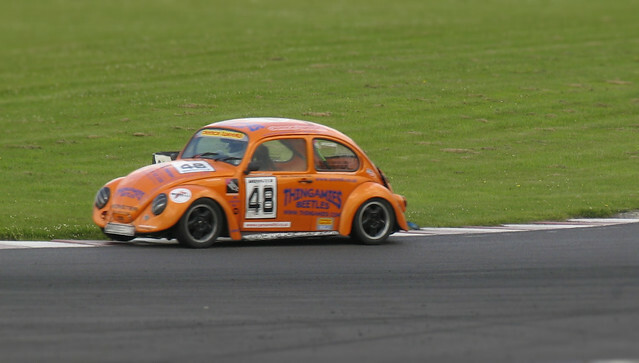 Castle Combe Circuit Car Track Days provide you with the opportunity to drive your car around a race circuit. 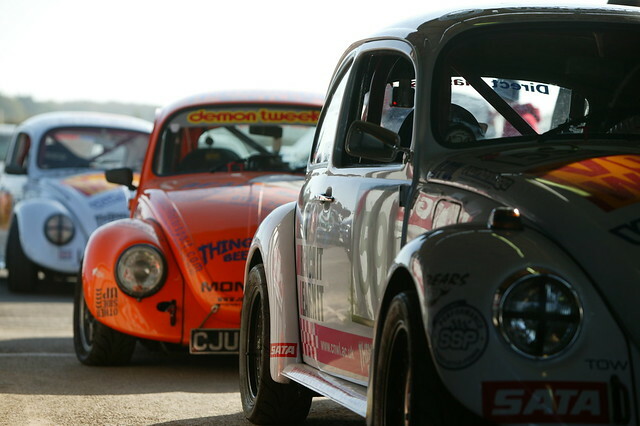 Your day will start with a detailed safety briefing given by a senior Castle Combe Racing School instructor. 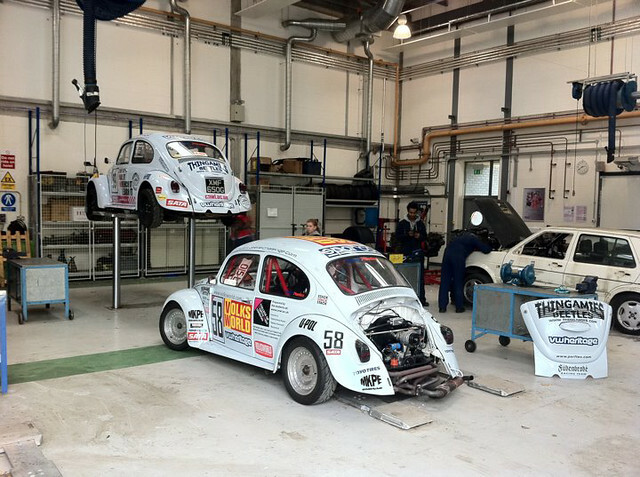 They will explain the rules and safety requirements and provide an insight into circuit driving before you go out on the track. The day runs from 9am-5pm, there is a lunch break from 12:30-1:30pm. All drivers will need to be at the circuit for 8am, to complete the on day administration, sound check and attend the compulsory safety briefing. 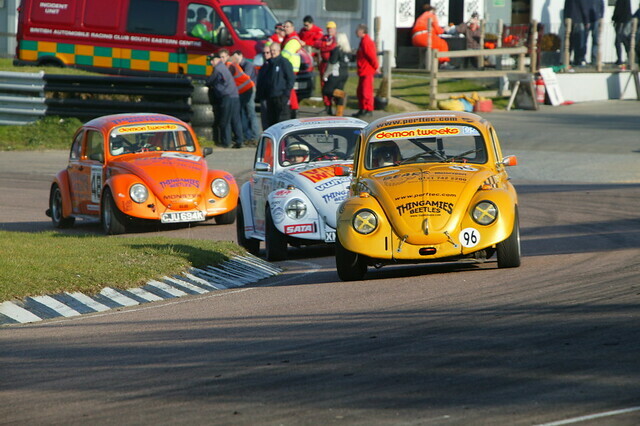 There is a maximum of 20 cars permitted on the circuit at any time. 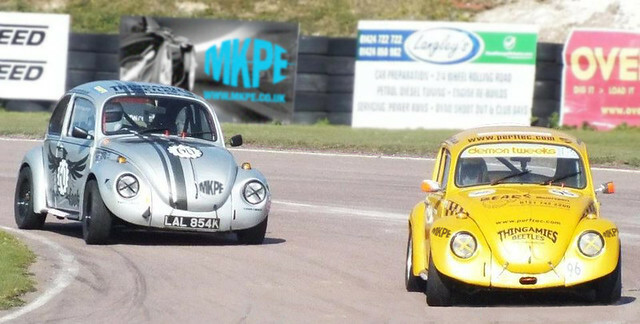 New to Track, don’t worry Castle Combe will look after you. 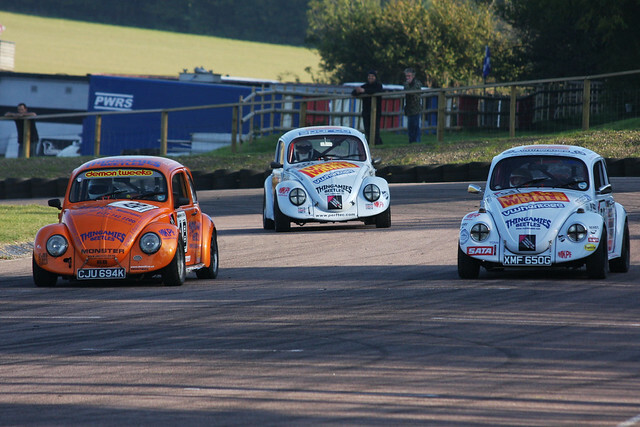 If you are new to Castle Combe Circuit or have not driven on a track before, let them know when you book your place, they will then send you detailed step by step instructions so you will know what to do when you arrive. Everyone has to start somewhere and they will assure you of a friendly welcome, they will provide you with an extra briefing and, subject to numbers, group you in a separate session. 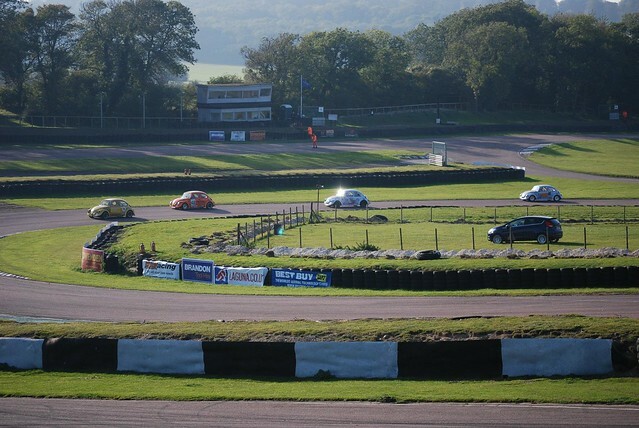 In that first session, they will take you round in a Castle Combe Racing School saloon car, pointing out the correct lines and braking points. The instructors are available all day to give assistance if required. 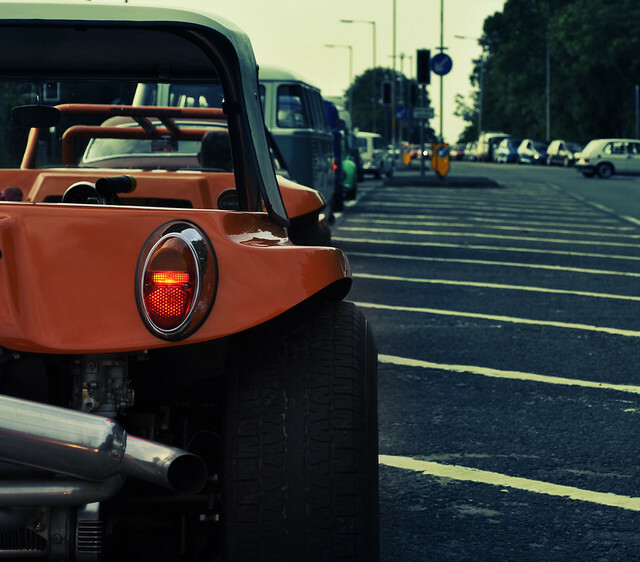 All vehicles must comply to the strict noise limit of 100db(A), which is measured at ∏ metre from the exhaust outlet at 4500rpm. 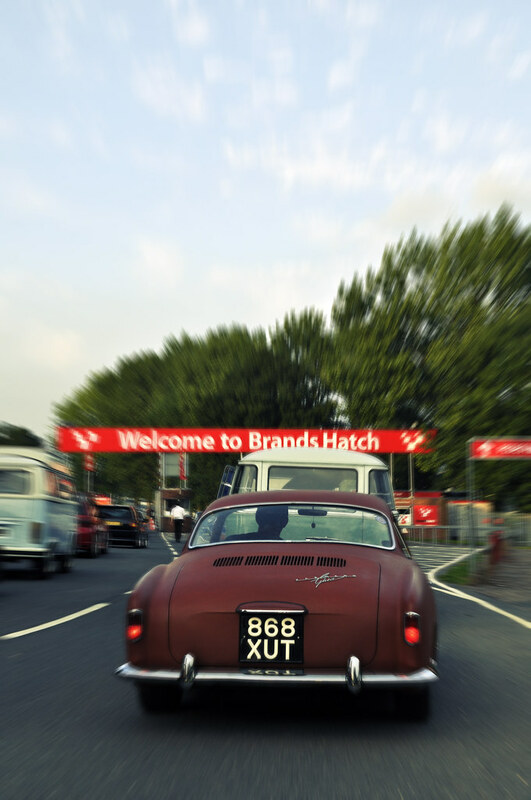 All vehicles will be sound checked prior to taking to the circuit, please ensure that your car is in suitable condition for circuit driving and to MOT standard. 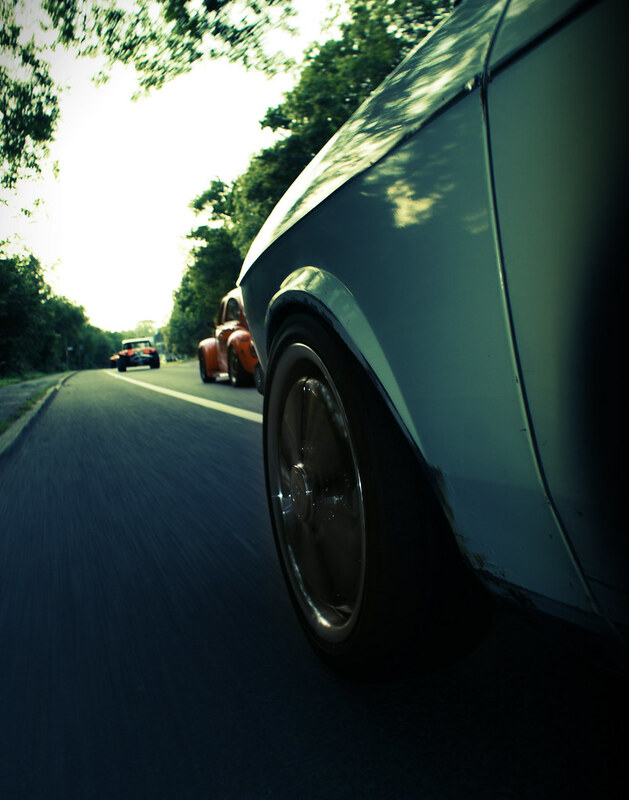 Cars fitted with slick tyres are only permitted subject to strict monitoring of driving standards. 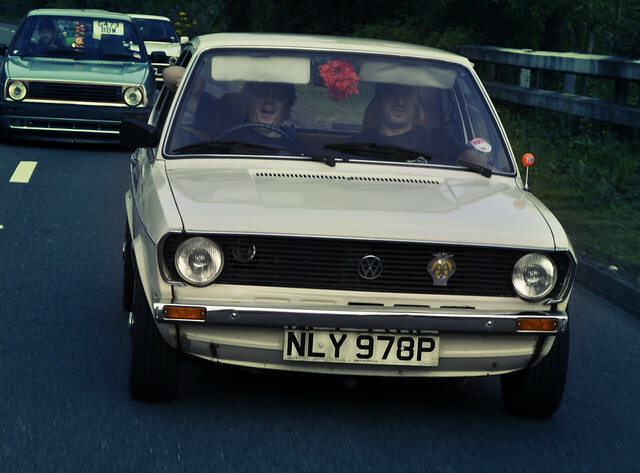 In the event of a car failing the sound check, then the driver will be entitled to a 75% refund. 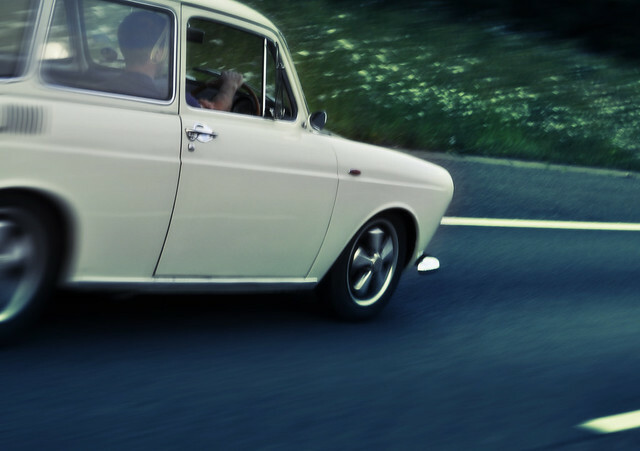 If you are unsure if your car will get through the noise test, then you could always come over to get it noise tested prior to booking a place. 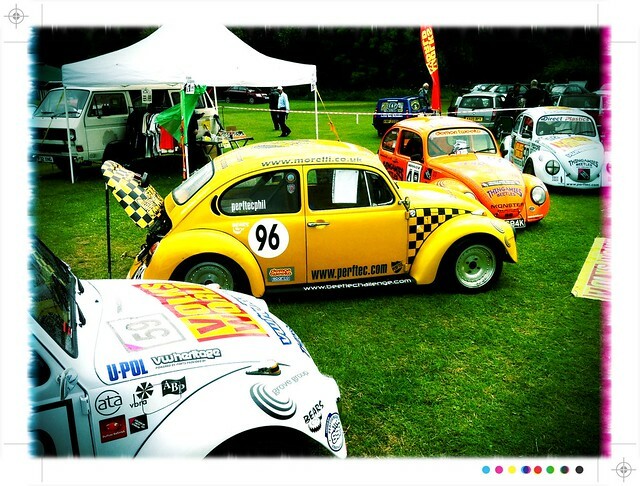 You don’t need a V-Dub to take part but we very much encourage it. 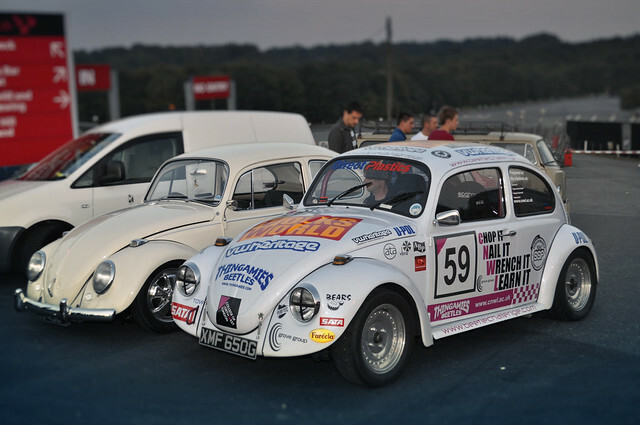 Cost for the day is just £130.00 that is £40.00 off the normal track day cost, and use special code VW2011 when booking to ensure you get your discount. 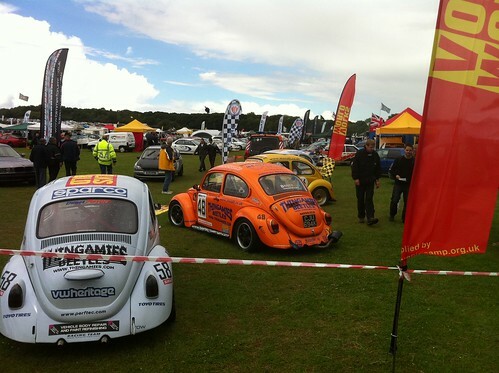 A slow start to the season has given the divers who were prepared a head start with getting some early points on the board, Steve McGillivary has seized the opportunity and we have seen his ever reliable 1302 take an early lead, not only has he taken an early lead in the Beetle Challenge but has also risen to 4th over all in the Tin Tops. 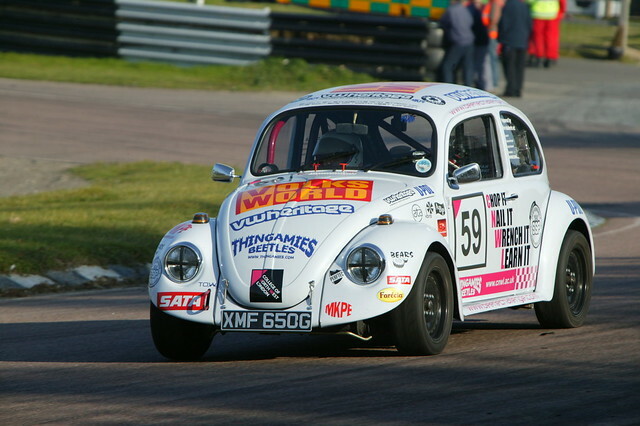 The next round at Mallory Park on May 30th will see Steve fighting to keep his points lead ahead of a larger grid of Beetles. 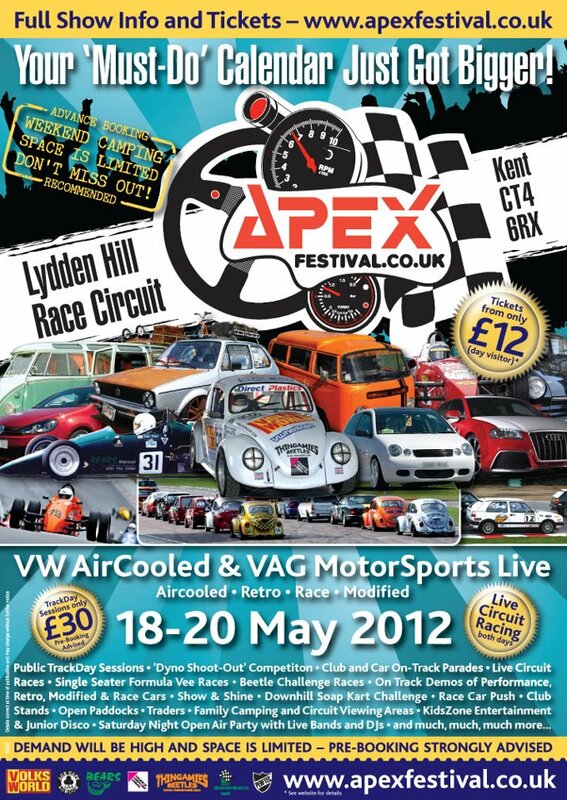 Be sure to keep up with the action on Motors TV who will be giving live coverage of the meeting. 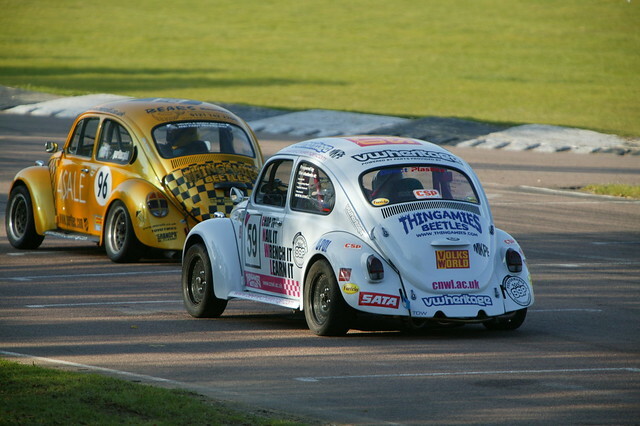 That’s be Nick in the Red beetle doing battle with a Fiat..
Absolute Bargain £3500 no offers. 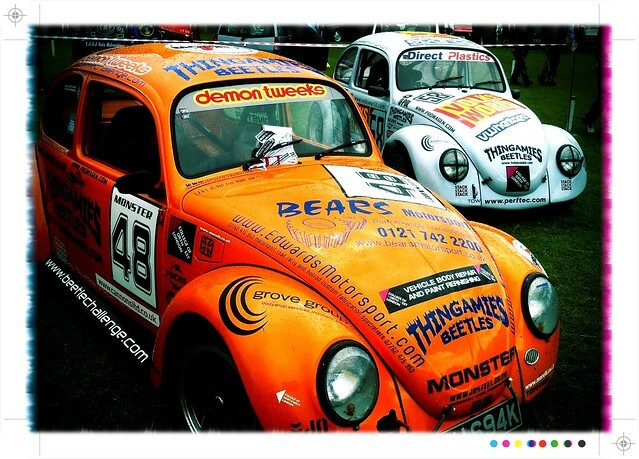 This is a complete get in & drive car ready for the 2011 season. 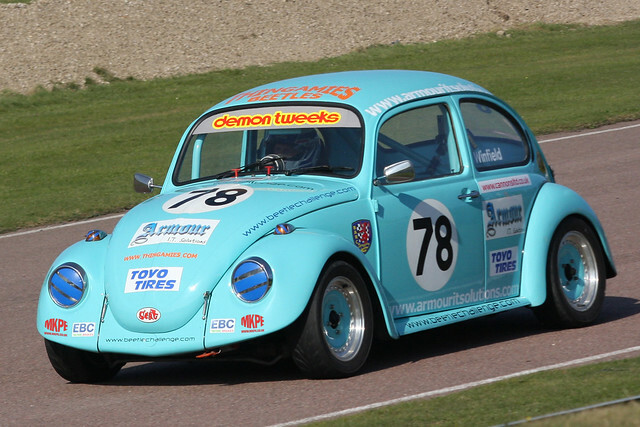 Ex-Rich Welsh Beetle Cup Car recommissioned and raced in Beetle Challenge since 2009. 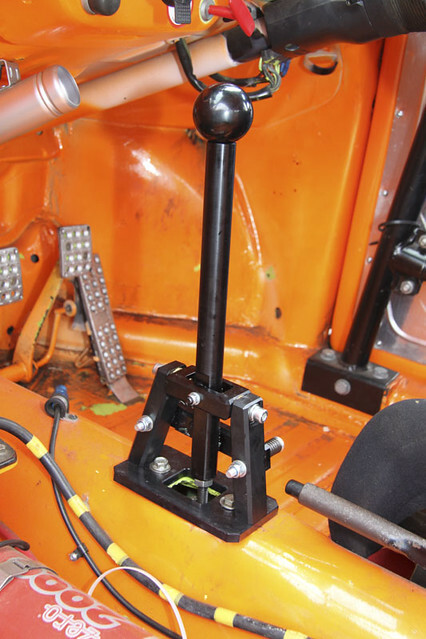 Fitted with a strong 1641 still basically in Cup spec but now fitted with twin Empi HPMX40’s for extra grunt and power. 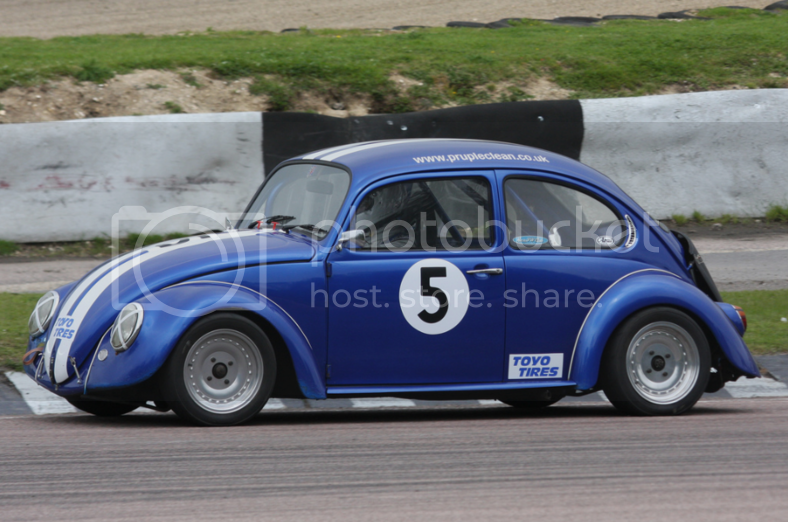 Car handles really well so would suit a novice or experienced driver. 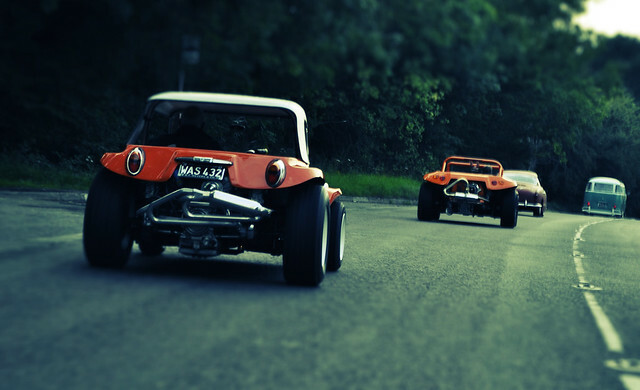 MOT’d and taxed. Resprayed in 2010 in Renault Sport yellow. Do you really think that a 2387cc can lay down the power on the skinny 185 15 Toyo control tyre? F*ck knows - but we might find out soon!